Technology end-user purchasing behavior has changed from “one-stop shopping” to selecting different outlets for products and implementation services. The indirect channel has responded by fragmenting into an array of firms that cover the full spectrum of business models from fulfillment to implementation. Unfortunately, few manufacturers have adapted to—or are even aware of—the new channel landscape. Manufacturers who measure and manage the new channel by old revenue-based metrics waste time, attention and money on programs that do not build revenue or market share. Worse, they miss opportunities for the new channel to promote, specify and sell their brand. 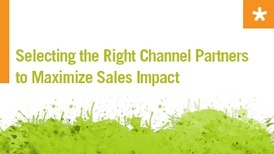 Manufacturers must determine what their end-users actually do when purchasing and implementing solutions and then build balanced channel programs to serve them. Balanced programs provide market and geographic coverage, plan for change, and organize to take advantage of the focus and flexibility offered by second-and third-tier partners. The management challenges are greater–but specialist help is available, and the rewards are well worth the effort.